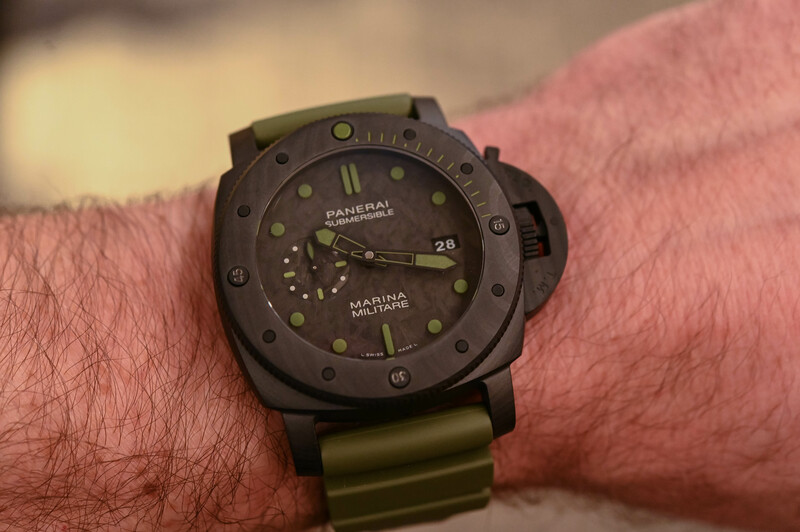 The bold Carbotech Panerai Submersible is back in military attire with a unique experience in the box! This year, at the SIHH 2019, the main focus of Panerai will be on the Submersible watch – a bold and back-to-basics move to refocus the brand on the diving world. The first of the watches to be introduced is a “militarized” version of the impressive (and surprisingly convincing) Submersible Carbotech. 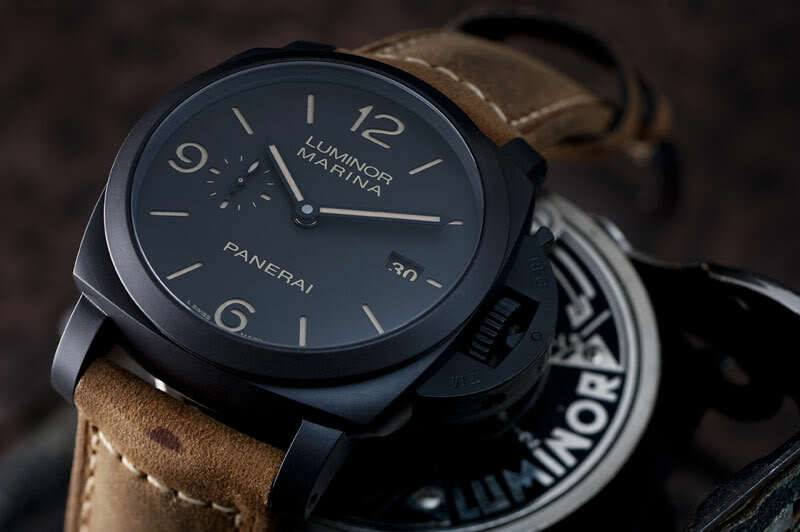 But that’s probably not the only thing that will grab your attention because Panerai is introducing a special something in the box… In one word: experience. 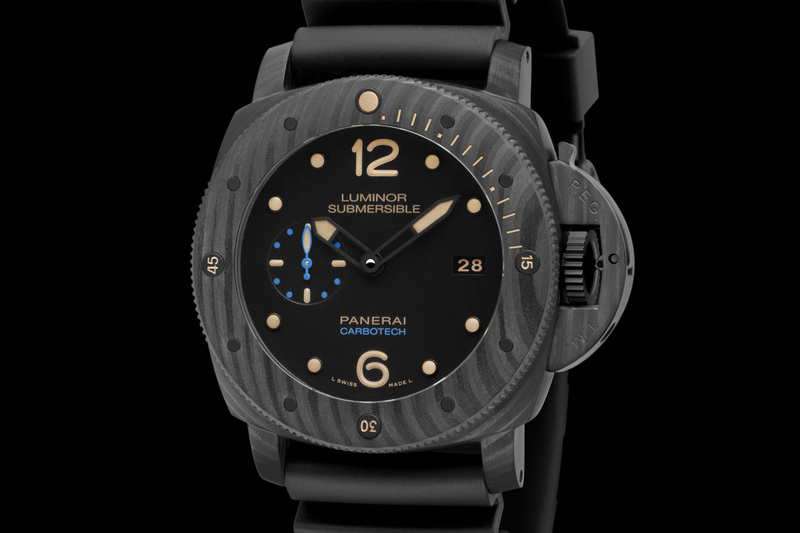 Meet the new Panerai Submersible Marina Militare Carbotech PAM00961 – and the extra surprise in the box. Before we reveal the surprise, let’s take a look at the watch. 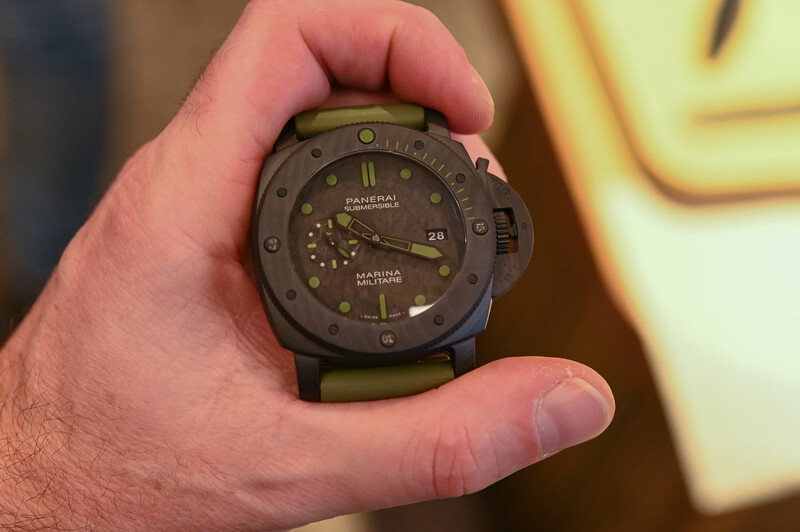 The new Panerai Submersible Marina Militare Carbotech PAM00961 isn’t entirely new to us but has to be seen as a variation on the existing PAM00616, a watch that we extensively reviewed and tested – and a watch that convinced us for being rugged, focused and much more comfortable that it could have been given its gigantic proportions. This latest version comes with a new dial and new colour codes. 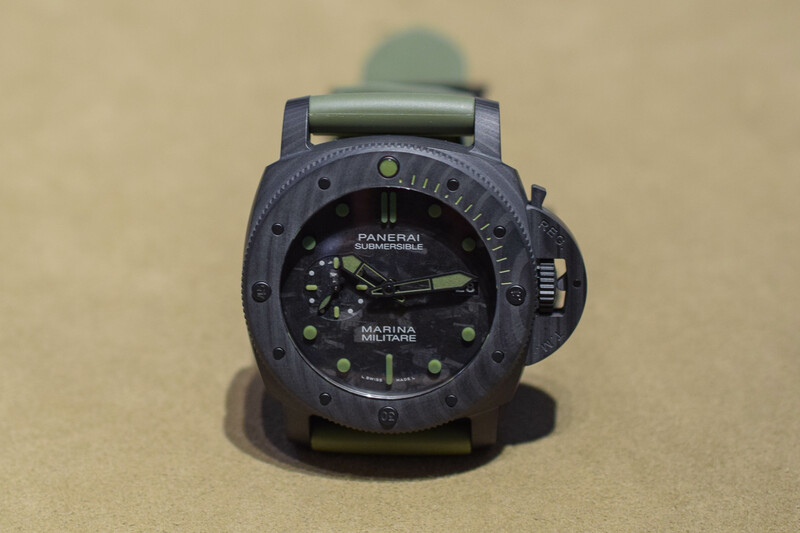 No more blue accents but military green and the words “MARINA MILITARE” printed on the dial. The case of the Panerai Submersible Marina Militare Carbotech PAM00961 relies on the 47mm case size and construction we’ve seen on the previous Carbotech. This material, which was nicknamed “Camo Wetsuit for Stealth Commandos” by our author Rebecca (kudos for that name), is actually a proprietary carbon composite resulting in an uneven matte black appearance with a characteristic Damascene steel or marbled effect. The case, the bezel and the bridge are all made from Carbotech. Produced with thin sheets of carbon fibres, which are then compressed at high pressure with a high-end polymer (PEEK) to bind the composite material, Carbotech is stronger and more durable than most carbon fibres. Even better, no two cases can ever be the same. 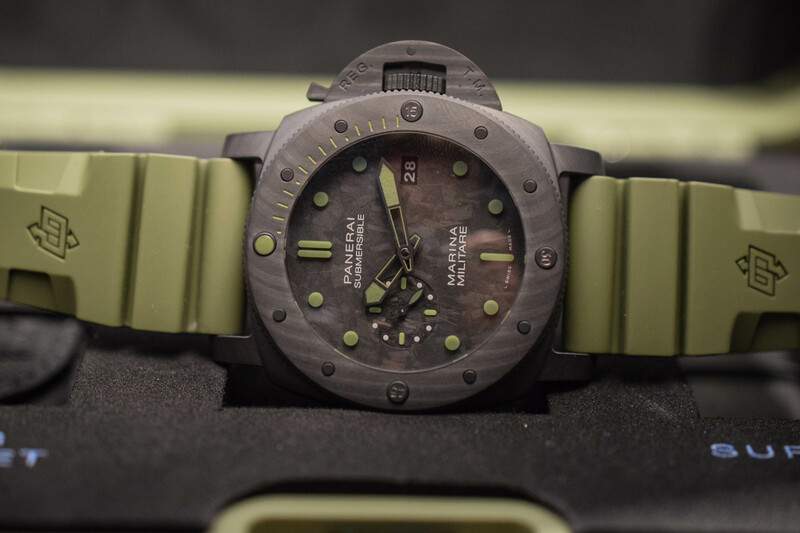 For this new PAM00961 version, the dial also relies on Carbon, with an appropriate camouflage pattern. All the indexes, with a slightly different layout than the 616, are coated with a khaki green shade of luminescence, as well as the hands – again for a military look. The dial features hours and minutes in the centre, a small seconds counter at 9 o’clock and a date at 3 o’clock. 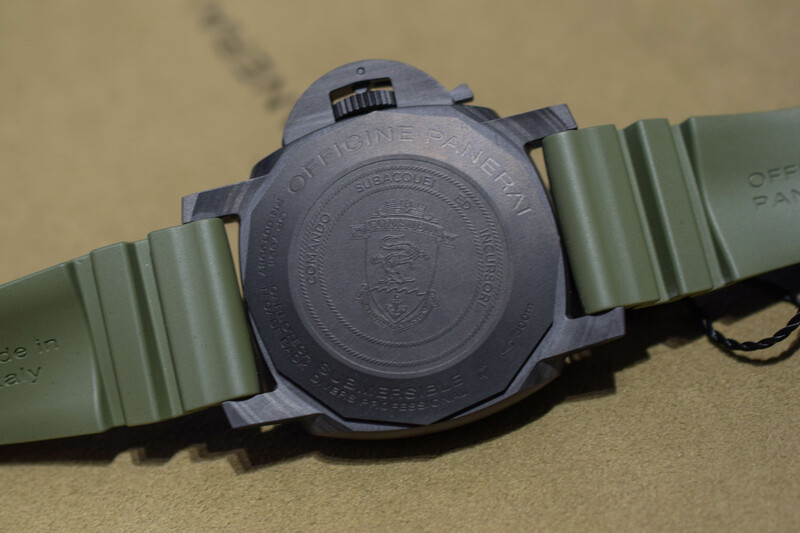 The final touch is given by a matching military green rubber strap, which admittedly gives a (very) robust look to this Submersible Marina Militare Carbotech. Now on to the important things to know about this PAM00961. 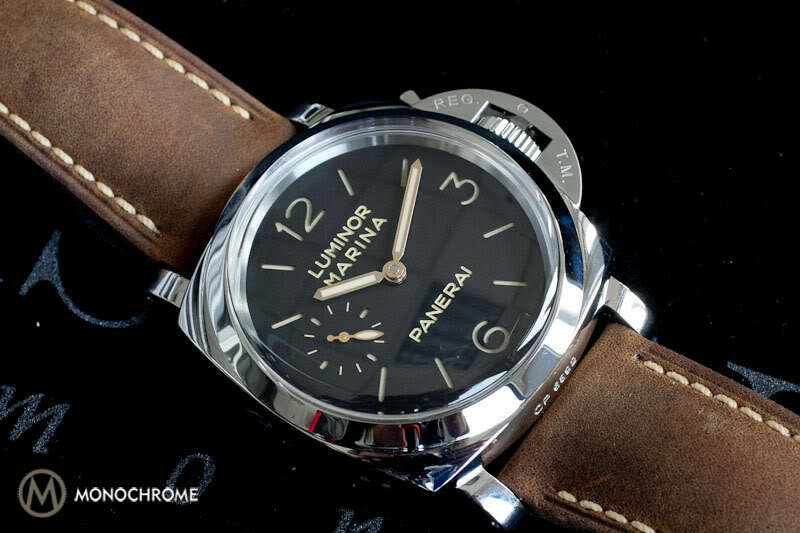 Panerai wants to focus on two things with its upcoming watches. First, exclusivity. As a result, this watch is a limited edition of only 33 pieces reducing the chances that your neighbour has the same model. Then, experience. This watch has actually been created with Comsubin, the Diving and Commando Group of the Italian Navy – and its logo can be seen on the back. But that’s not all. In addition to the watch, future owners will be able to enjoy a unique experience by taking part in a training session with Comsubin members. 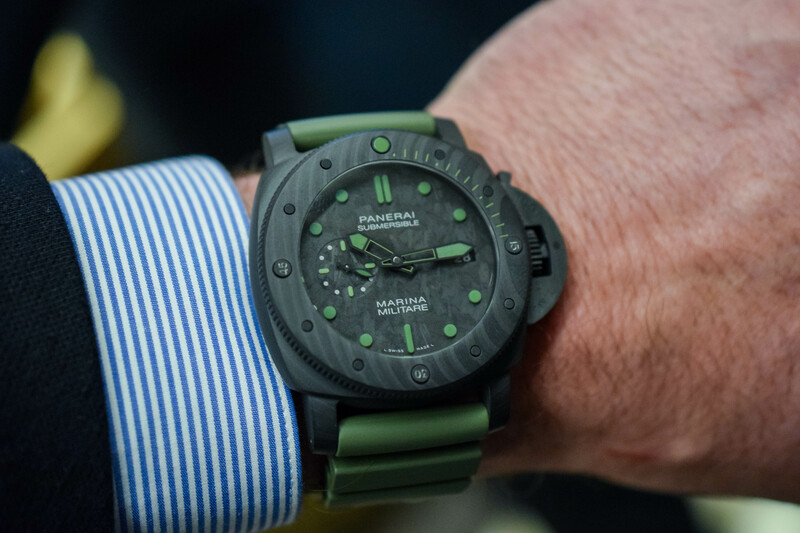 Hardly anyone who is not a member of this elite commando of frogmen can take part in this experience, which Panerai is offering exclusively to its most passionate clients. This also explains why it is limited to 33 pieces. 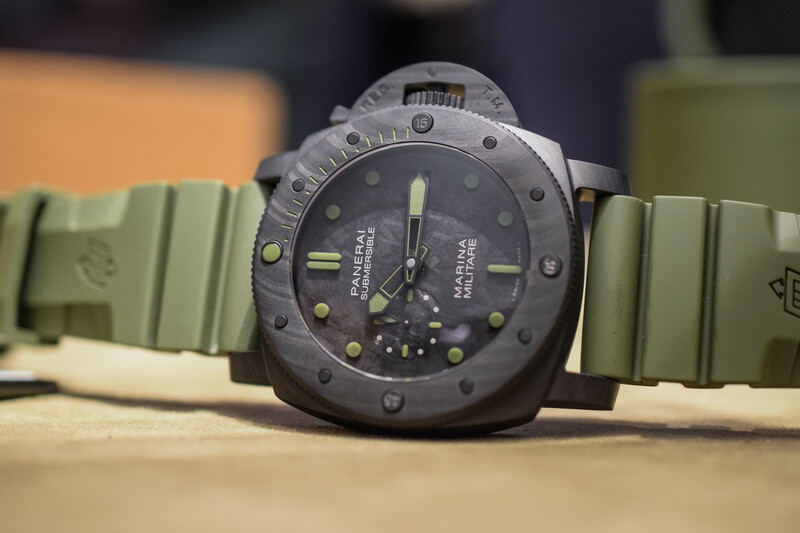 The Panerai Submersible Marina Militare Carbotech PAM00961 will be officially unveiled in the coming days and its price is expected at EUR 39,900 – including the diving experience. 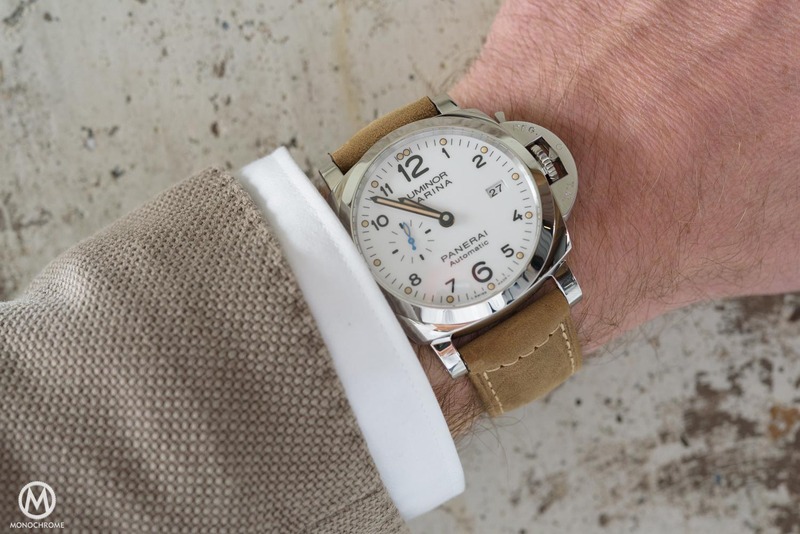 A non-limited edition without the experience and white indexes instead of khaki green – ref. PAM00979 – will also be available at EUR 19,900. 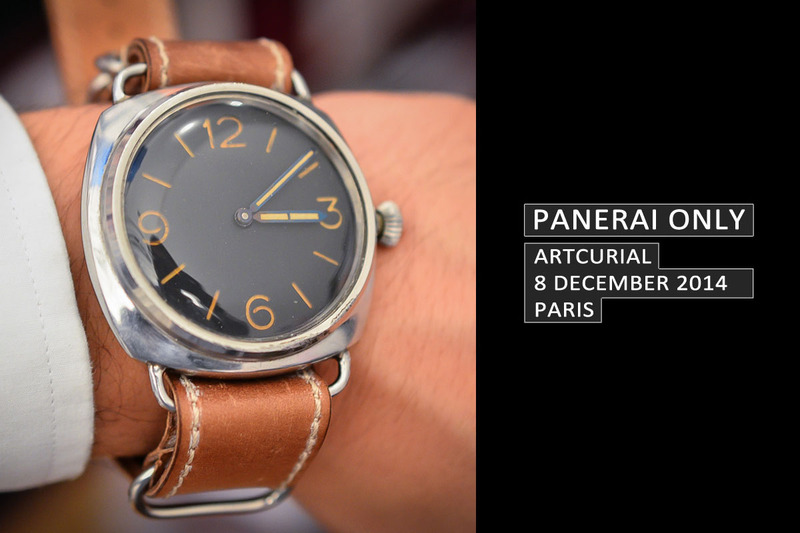 More details at www.panerai.com. As an extra, the watch is delivered with a personalized experience; a training session with Comsubin, the Diving and Commando Group of the Italian Navy. You know the saying, “if you’ve got nothing good to say it’s best not to say anything at all”…. yeah, I’m saying nothing. Feel free to delete this comment. I would like to add…….